SPECIALISTS IN MARGARET RIVER KAYAKING, MOUNTAIN BIKING, SURFING, SCENIC/WILDLIFE AND WINERY/BREWERY TOURS. Rated #1 on TripAdvisor. Experience the absolute best of Margaret River with our personalised “off the beaten track” tours. 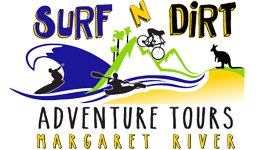 Surf N’ Dirt Adventure Tours is a local award winning Margaret River company. We provide amazing Margaret River experiences and are all about making your time in Margaret River as exciting, fun and memorable as possible. When it comes to experiencing the best of Margaret River, we are the specialists!